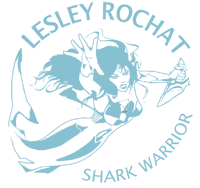 Hundreds of children form the SOS – A plea for help to our Country’s Leaders, and to world Leaders, to help Save Our Seas, Save Our Sharks, Save Our Seafood, Save Our Sealife, etc. and most of all SAVE OUR SELVES! Afterall the Oceans are our life support system. 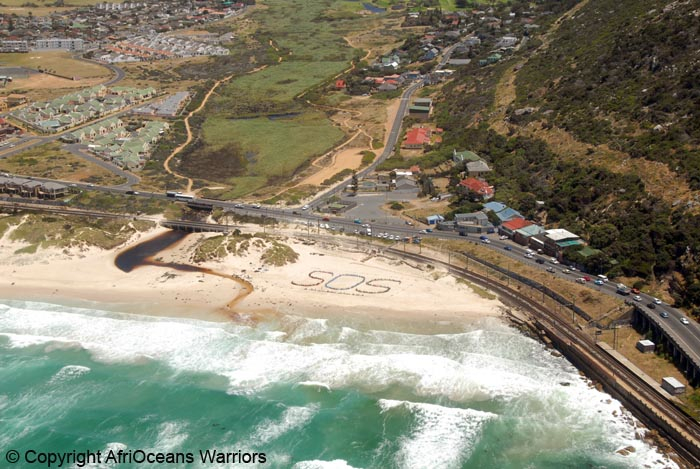 AfriOceans Warriors – the Voice of our Oceans! On Wednesday, 2 December 2009, 430 learnersfrom 14 high schools and junior schools from the South Peninsula in Cape Town, South Africa, including 30 learners from COSAT in Khayelitsha, called the young AfriOceans Warriors, walked 8km in howling South Easter winds along a stretch of the coast from Muizenberg to Glencairn to give a ‘Voice to the Oceans’. After forming a symbolic S.O.S. on the beach, which was photographed from a helicopter, they hiked on to their final destination where invited dignitaries welcomed them, and to whom they handed a copy of the AfriOceans Warriors Scroll to each dignitary. 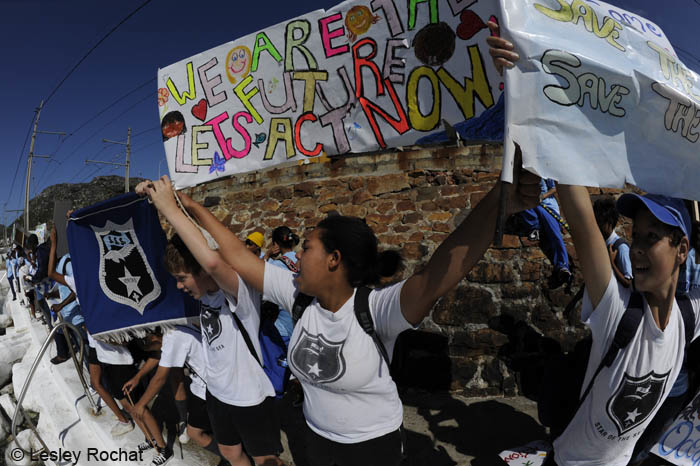 The scroll highlights their concerns regarding the state of our oceans, requesting our Country’s Leaders to take action and allow the youth of South Africa their constitutional right to inherit healthy oceans. 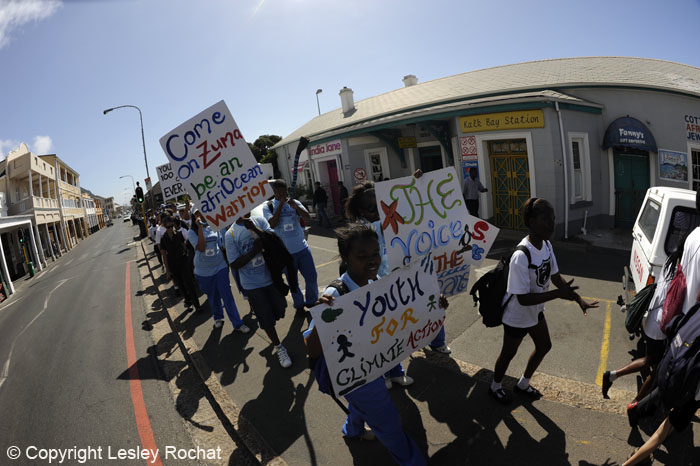 The AfriOceans Warriors line up at the start of the hike at Muizenberg corner. Given my work load at the Centre time was strained, but with the help of many people, and the supporting NPOs, the AfriOceans Warriors campaign, the new AfriOceans Conservation Alliance (AOCA), initiative was launched. AOCA is the NGO I founded in 2003 which is committed to aligning with others who share its vision, and for this exciting event the support of a number of governmental and non governmental organizations was rallied together including SOS Shark Centre, SANCCOB, Dolphin Action Protection Group, Centre for Conservation Education, Kelp Environmental Learning Project, Seal Alert SA, Table Mountain National Park, City of Cape Town (YES programme), Jungle Theatre, Baboon Matters, Metrorail, NSRI, Western Cape Education Department, Science Education Resources Initiative, SA Navy, KEAG, Whale of a Heritage Route, REEF, Bright Weights, Pisces Divers, and Shark Lady Adventures. 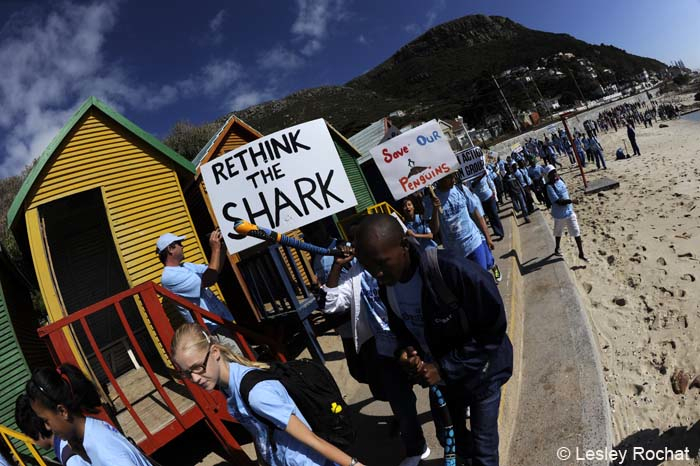 The hike was inspired by a talk and screening of the award winning documentary, ‘Sharks in Deep Trouble’ presented by me some months back to 200 people, half of which were from the Muizenberg High School. Unbeknown to me at the time Leonie Jacobsen, Deputy Principal of Muizenberg High School was so affected by the film that she encouraged her school learners to adopt the AfriOceans Warriors campaign as their Community Project for 2010, and launch it through the False Bay Global Environmental Awareness Hike she initiated. A quick stop at St James where the Star of the Sea school joined the group. 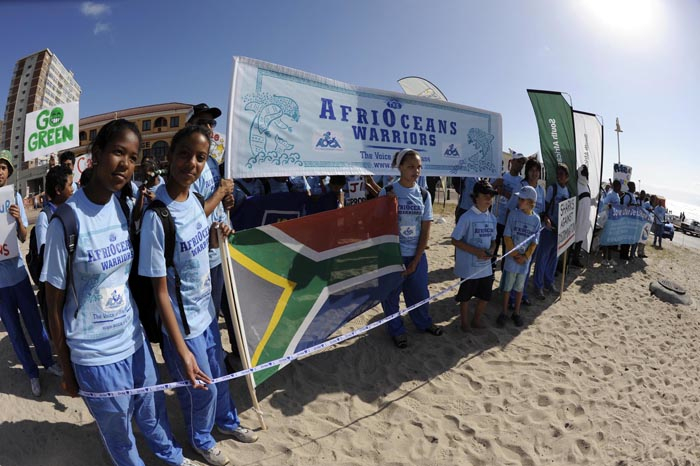 The AfriOceans Warriors Campaign empowers the youth to become a member warrior of a unique African tribe who take action for our oceans. These young AfriOceans Warriors take ownership of their natural heritage and become leaders of awareness campaigns for Africa’s Oceans. The campaign encourages a reflection of African tribal roots and culture where profound values and empathy for the natural environment and animals is reflected. 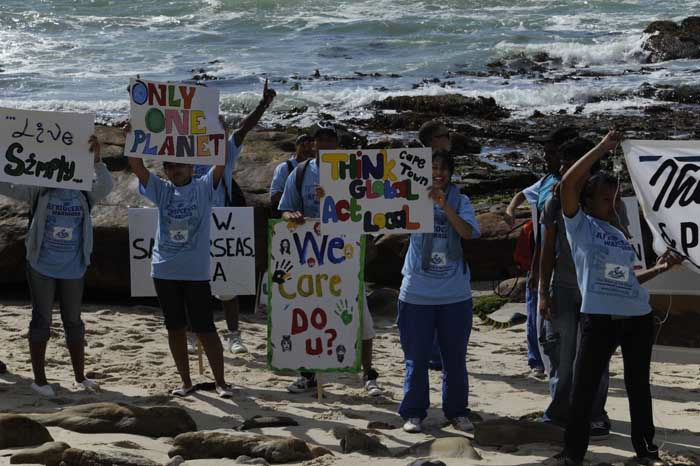 Armed with the correct knowledge and tools these young AfriOceans Warriors will take positive action in order to raise awareness and help save our oceans. They are set to become the Voice of Africa’s Oceans! The AfriOceans Warriors head for Clovelly. 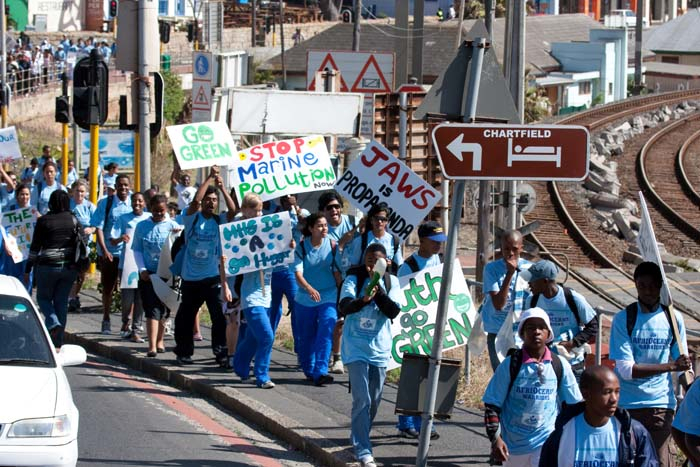 The hike begun with a celebratory ribbon cutting ceremony at Surfers Corner and with 100 AfriOceans Warriors. 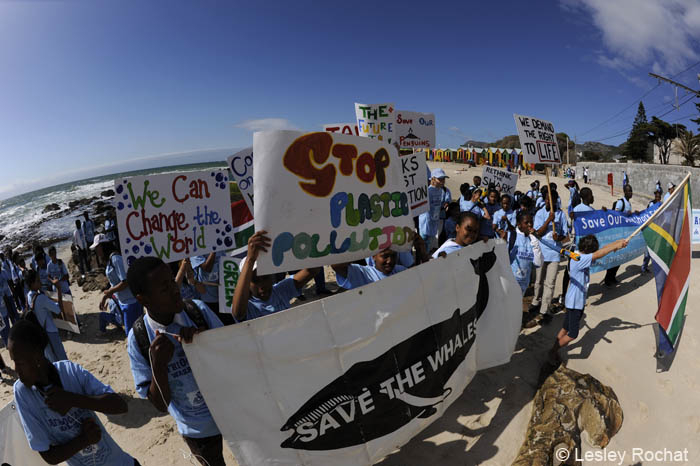 The blustery South Easter could not dampen the enthusiasm of the long line of young Warriors as they chanted ‘Save the Oceans, Save the Sharks!’ while displaying their hand painted banners, including the banners of the supporting NGOs. Two giant ‘penguins’, from Table Mountain National Park, accompanied by SANCCOB, walked the entire route in solidarity with the young AfriOceans Warriors, and Cape Medical Response paramedics and the NSRI ensured the event went smoothly without a single medical incident of any kind. The bold cry for help to save our seas so that we might we save our selves is seen from afar. It was not an easy task to position everyone, especially because we had to wait for the helicopter in the howling wind and shouting as I had to everyone. I thank each and every learner, and adult that helped to make such an awesome formation – I told you all it would be worth it and you would be proud of what we did when you saw the pix – THANK YOU! 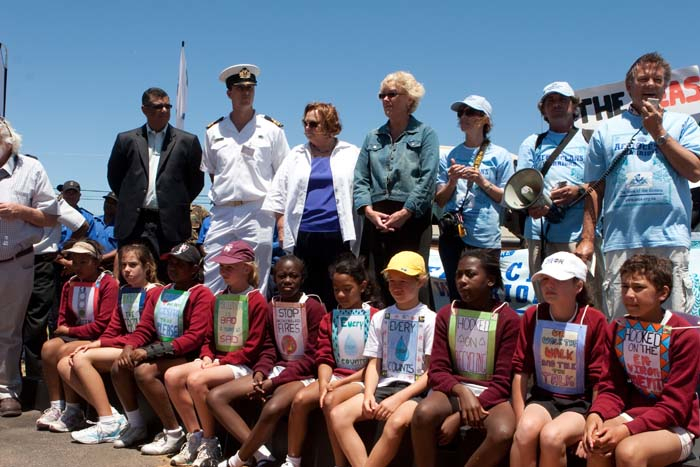 Reaching Clovelly corner, the Warriors were joined by over 300 more learners from Fish Hoek, Ocean View and Sun Valley schools, and sailors from the SA Navy. 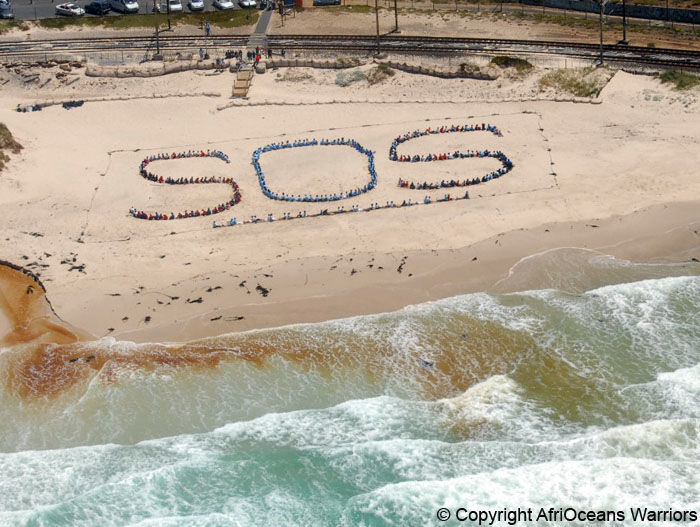 Here they formed a large symbolic ocean conservation message S. O. S. The powerful message it sends out to the world is a call for help from the youth to South Africa’s leaders, including world leaders, imploring them to make the plight of the Oceans a priority and proactively motivate solutions. 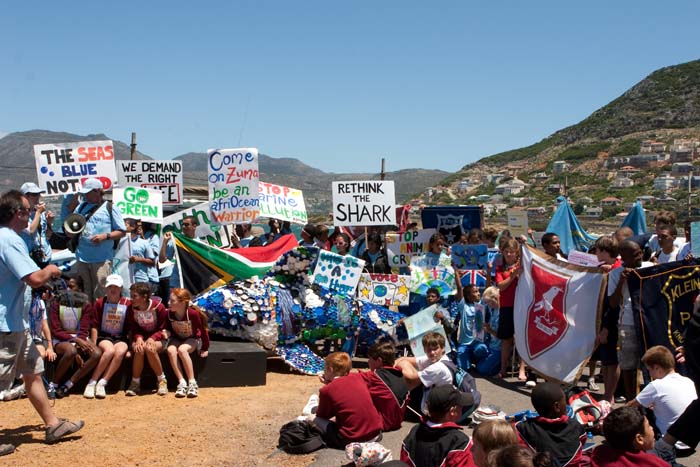 Fish Hoek Primary fringe the platfrom with their powerful messages boldly displayed. The dignitaries behind them from left: Juan Benjamin EMDC South,Commander PG van der Berg SA Navy, Marian Shinn MP, Councilor Nicki Holderness, and speaking Horst Kleinschmidt, AOCA Director. Finally, the weary, but elated hikers reached their end point and were welcomed by Jungle Theatre’s huge Shark, made out of recycled plastic bottle tops. Awaiting them were invited dignitaries who each addressed the Warriros: AOCA Director, Horst Kleinschmidt, Councilor Nicki Holderness, Marian Shinn MP, Commander P.G. van der Berg of the SA Navy, and Juan Benjamin Circuit Manager, Education Metropole District Circuit South. The Jungle Theatre shark made from re-cycled plastic and young AfriOceans Warriors at the end point. In closing I thanked everyone for their exceptional efforts and shared some of the highlighted 10 environmental issues of concern, including climate change, overfishing, poaching and poor fisheries management, contained in the hugely symbolic AfriOceans Warriors Scrolls, which were signed by two senior learners from each of the two lead schools, Muizenberg High and Muizenberg Junior. These scrolls were then handed over to the invited dignitaries by the learners. 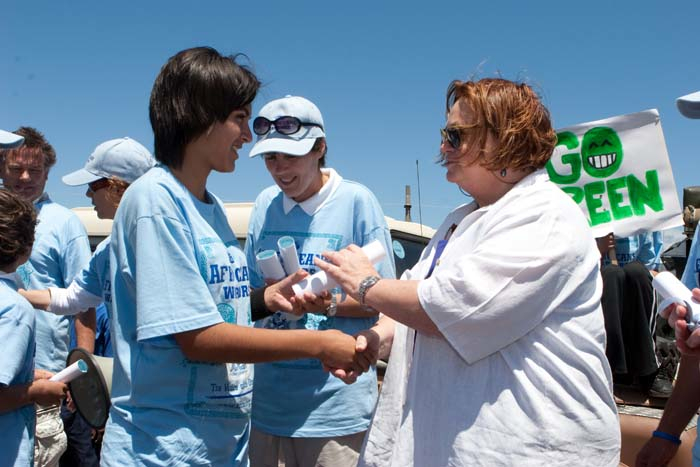 An AfriOceans Warrior scroll is handed to Marian Shinn, MP. Thereafter, and thanks to the fantastic generosity and commitment of Metrorail, a free ride home by train was a welcome relief for the weary hikers, as they chatted and shared photos on their cell phones and swapped stories about their historic adventure as young AfriOceans Warriors. From the bottom of my heart I wish to thank all the dignitaries, partners, NPOs, sponsors, participating schools, their learners and teachers, volunteers, the helicopter owner and pilot – a good friend of mine, the aerial photographers, my supporting team, and in particular a special mention of the significant contribution by the initiator of the hike, Leonie Jacobson, Deputy Principal of Muizenberg High, supported by Principal of Muizenberg Junior, Dee Cawcutt, assisted by Lalette Mcgillewie, and Alan Linder of the Whale of a Heritage Route. It is amazing what we can acheive in so few days (we only had 8 working days to pull this off!) when we stand united! My dream of creating an army of eco warriors is being realised, thank you! See more photos of the day on in my Photographer, Surface link. Chief Warrior, you have done us all proud. What an amazing and inspiring selection of photographs and text that sums up the day that the AfriOceans Warriors was launched. When is the next hike? This is an awesome campaign, well done to all! I hope we see more of it in the New Year, Africa needs to be heard! This is a fantastic and inspiring campaign and one I hope will be replicated in other countries. WHEN WILL THE WORLD LEADERS START TO LEAD THE WORLD, INSTEAD OF WATCHING IT DIE IN FAVOR OF COMMERCIAL INTERESTS? A BUNCH OF SPINELESS CREATURES ARE LEADING THE WORLD. THE EUROPEANS TRIED, THANKS MRS. MERKEL, BUT THE US AND CHINA PREVENTED SUCCESS. THEY OBVIOUSLY DON’T KNOW THAT THERE IS NO "PLANET B". RATHER FROM INDIVIDUALS WITH THE PEOPLE BEHIND THEM. Congratulations, Lesley!! That is the way to go!! Congratulations to the new breed of warriors! What an inspiring campaign to help save our seas–and yes, Save Our Selves. Our children deserve to inherit healthy oceans. We must respond to this SOS cry at once!